1480 sq foot A-frame, real hardwood floors. Three Percheron horses!! Property is on 23 acres. Fishing, boating, swimming, jet skiing nearby. Snowmobiling, snowshoe and ice skate in the winter. Tons of wildlife including moose, deer, elk, black bear, eagles, hawks, turkeys etc. Minutes from Priest Lake, Pend Oreille Lake and Sandpoint (with a city beach). Pets are welcome. It's great for weddings, family reunions, retreats, etc. Plenty of parking for large family reumions and other types of events. Places to pitch tents. Fenced yard - pets must be in house, yard or on leash. May smoke outside. Wildlife is various and abundant. 4 sets of eagles have built their nest in close proximity to the cabin; we feed the deer and elk in the winter. We have refurbished the entire house so the inside is virtually brand new. Close to Priest River, Hope, Sandpoint, Coeur D'Alene, City Beach, Pend Oreille Lake and River. On 23 acres. My husband Rocky and I bought the land in 1996. Rocky built the home himself in 1997; in fact he built almost every home around us. We love animals. We have five German Shepherds and three Percheron Draft Horses. We have 3 "babies." We rescued their father, Gus, the stallion in 1998 when he was 13. He crossed the rainbow bridge 3 years ago. We rescued the mother, Ebony, in 2007. We lost Ebony last year (2015). We are left with their three "children" - Blackjack (boy - foal) - born May 1, 2009; Pepperjack - (girl - filly) born April 30, 2010 and Hijack born April 30, 2011. In 1996, my daughter-in-law and I were sent on a trip to buy property in Idaho, Washington, Montana or Oregon. The very first place the realtor took us was Sandpoint. After we drove across the Long Bridge into Sandpoint, we knew we were home and we looked no further. My husband built their home. On our property, he built the A-frame and later a state-of-the-art dog kennel for me to breed and train German Shepherd dogs. We trained for police, protection, search and rescue, cadaver, companion, obedience (you can't always tell it with my 3 "pups" who are 3 years old. My husband changed the dog kennel into our current home in 2011. We live on the property but can't hear or see you unless you want or need something. We try to give you as much privacy as we can. The list is too long. The house itself is comfortable and has tons of storage places and room for sleeping bags if needed. Wildlife is everywhere. We have 4 pair of nesting bald eagles nearby. Moose and deer are abundant along with black bear, geese, ducks, wild turkeys and more. We've fed the deer through the winter of 2015-16 and have up to 30 now hanging around. It's a jacuzzi tub downstairs - the motor no longer works but it's a great size and gives perfect bubble baths for one or two adults and children as well. We are on 23 acres in the mountains - your privacy is guaranteed but we also live close by if you need anything. Full kitchen - we have additional photos if requested. LOL about the Wifi - please if you ever come back let us know ok? We would have gladly fixed it. Thank you for staying with us. To be fair, we were not looking for an cabin and we booked this property because we could not find anything else in the area for a family reunion. Thankfully because of the reunion we were not at the cabin much during the day. The beds and linens were clean and the cabin tidy. The grounds however were pretty run down, lots of unused things lying around and the yard was dry grass. Some things to be aware of. There is no cell phone reception. We had 4 different phones on 2 different networks and no coverage.. The fence is electric around the horses, watch the kids!! The screen upstairs was left to cool the place but it does not close tight, as a result bees! The wifi did not work and I did use the password given in the information. The remote was missing for the dish network so that was a bust. It's not for little kids!!! lots of stairs and the decks are high. Also when you check in the door is unlocked and a key is left by the door. Great idea, but the key left did not fit the door! So everyday we loaded up most of our stuff because we could not lock the door. All of this is kind of what happens in a place you do not know but the most disconcerting thing is that I left 3 messages for the owner to help out with some of the issues and absolutely no response. Summary! Ask a lot of questions before you go!!! Place was nice, not well heated. Had to have noisy space heaters running. Bottom floor was always cold. Could use lamps close to beds. Maybe some small rugs in winter to make lower floor seem less cold. Too many steep stairs for us. Kitchen could have done with better cooking pans most had non stick coating peeling off, and were small. If saying could house for 9 people, should have dishes and glasses and cookware for 9 people. We had trouble on road even with snow tires, might give a precaution to others for winter weather. Just a few suggestions. Thank you. It is in a beautiful location. My husband enjoyed snow shoeing. Sadly, our stay at Northern Exposure Ranch did not go well. The cabin itself is nice. We made friends with the 3 horses on the property. The views are great, the loft beds were comfortable, as were the two leather recliner/rockers in the living room. It had plenty of hot water and good well water. However, the downstairs bedroom was cold and the electric blankets did not work; it looked as if it hadn’t been cleaned since the last occupants - there was dust on the floor, on the silverware in the drawer, the coffeemaker, the microwave and the tile counters. VRBO’s description touts Wi-Fi access that’s basically non-existent. The password works to get you in but goes nowhere so loading apps for a weather report, directions, email, or information about local resources is futile. My guess is, the metal roof was a great shield against any signal trying to get in or out. If you’re bringing a cell phone, take note of who your carrier is. My daughter has Verizon and got “No Service”. With AT&T, I had at least 1 bar, sometimes 2 depending on where I stood. I lit a fire in the wood stove and within 15 minutes, long enough to warm the air in the flu to create an updraft, smoke began leaking from around the door and floor of the firebox - even after pulling the tagged handle. A clogged flu pipe? Cathy’s instructions said to text her for assistance with the stove but with the wireless connection, there was no response. A comment indicated a Thanksgiving dinner was cooked there. I found this rather curious. The kitchen layout prevents you from opening the oven door more than 3-4 inches before hitting the top drawer of the cabinet. The refrigerator doesn’t seem to work. The food we brought didn’t stay cold and neither did the Blue Ice packs we stored in the freezer. On Tues morning we woke to a steady snowfall that, contrary to Monday’s forecast, continued all day. Tues evening, the lights started to flicker. At 10:00pm we lost electricity and spent the rest of the night in a cold, dark cabin with no running water. There was one large candle and one small one - no flashlights were available that we could find. Wed AM arrived with 15-18“ of snow. We’d heard nothing from Cathy (who lives atop the access road to the cabin), so I called to say we were leaving early; she did offer us a refund for Wed. After 2.5 hrs of shoveling, we left - only the main road to the highway was plowed. I wouldn’t rent this place again as a winter getaway - too rustic for me! We lived right on the property. You saw us going in and out. You waved. I asked for your problems and questions and you never gave me any. The people before and after you gave excellent reviews. Yes this is a rustic getaway and it is a secluded mountain property. Yes the electricity went out all over our mountain which is why we refunded you a night. There were flashlights and candles. You sound like me - probably like modern hotel rooms. But I love this house. 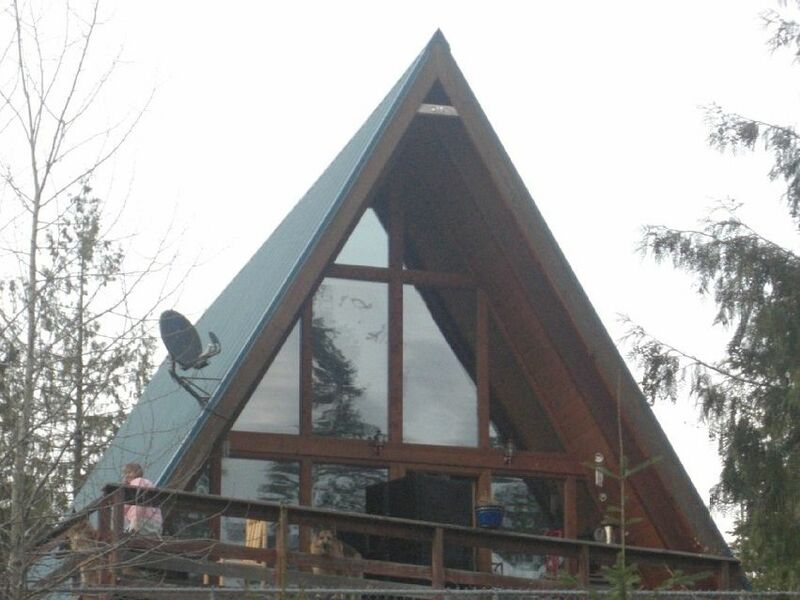 We lived in it for 13 years and its a hit with anyone who wants a secluded mountain retreat. If you want to try again some time I'll give you a 10 percent discount and this time I'll make sure you communicate with me. When we arrived, the house was full of flies. There are several loose boards on the deck that present a trip and fall hazard. There were only two bedrooms, not three as advertised. This was a problem for us as we were travelling with my daughter and her boyfriend. The house is located in the middle of nowhere. It is at least an hour from Priest Lake, not minutes. The laundry room was locked and not accessible to us. The musty, moldy smell coming from the downstairs bedroom was overwhelming and immediately set off my husband's allergies. At this point we decided it would be a health hazard to stay here. We attempted calling the owner as well as texting (as per the instructions on the welcome letter). We have never received a response. As we then had to rent two hotel rooms, it would have been nice to at least receive a partial refund but it doesn't appear that this will happen. 5. The home was professionally cleaned and there were no flies, no odors etc. ZERO health hazards – no truth at all to your complaints. It sounds like you are writing about the home in the Amityville Horror. 8. The note inside clearly told you that the laundry room was being remodeled (it was locked for insurance purposes and your stay was only for 2 nights. You are so very welcome. We are happy you enjoyed your stay. God bless. Our A-frame is about 8 miles from Sandpoint, 11 from Schweitzer Mountain Ski Lodge, 10 from Priest Lake and Priest River. Close to the Pend Oreille River and Lake. Plenty of fishing. We were guests at the cabin in 2007 and again in 2008. It is relaxing, and secluded. We saw several moose and a black bear during our second visit. We plan on visiting again in 2009 - it's like a home away from home. We will consider a negotiated fee if the other property you have found is comparable to ours.